Who’s That Cute Kid on The Beach? 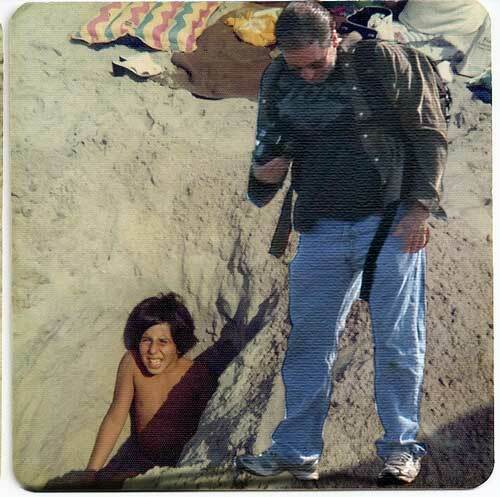 I got the push to make it seeing Before and After Pictures with a Twist on Buzzfeed where some dude inserted modern photos of himself into photos of him as a kid- but its more than cut and paste, he carefully considered the pose and details like shadow. Edit a childhood photo of yourself to include a more recent photo of you in a pose that makes it look like you were part of the original scene. Pay attention to matching pose, detail, and color values to match the original. You can go back to your past, at least in your own edited photo! It was a matter of cropping out the background. To make it match the color tone, I mucked with the levels and come color correct, and added a Fim Grain Effect to try and match the original. The trickier part was creating a shadow – I found some clues in a tutorial from PhotoShop Essentials. MOre or less you make a selection of the original figure, create new layer below the original, fill with black, use distorts and rotates to move the shadow, add some Gaussian blur, and lighten the opacity. And there it is- me on a beach taking a photo of me on a beach, then, now, together. It would have been funnier if (older) you had a shovel in your hands!